4. Relationships. Trail races are about relationships. Some of my best friendships have taken root through battling it out in the mountains for several hours (or 25 hours? ), fully engaged on the trail—grinding, fighting, gnashing, sweating, while encouraging each other all at the same time. At the end of the race, you sit together in the sun, barefoot and blistered. Beer in one hand, bowl of chili in the other. Mud-splattered-cake-battered ankles. And a big, salt-encrusted, full-faced grin. You laugh and you talk about the relentless climbs. You share stories of that blissful stretch of downhill delivered right at the perfect time. You connect with each other through shared turbulence. Races are about relationships; they are about contact. 5. Contact! We need more of it. We need to touch more. We need to lick more, tug more, hold more. This planet needs our touch, our footprints. We need often to hold a place in our hands and let its dark, green swamp sludge ooze and drip through our fingers and minds until we feel Place deep, deep, deep within. Tactile reciprocity. 6. Celebration. Trail races are a celebration. Because, for week after week, you wake up, hit snooze four to eighteen times before a shuffle-shuffle to your dank pair of shoes. You lace up to trot into the forest around a favorite loop or up a peak for that morning espresso buzz-shot of sun ray and stillness. You know what this is called? This is called ritual. This is called habitual action in natural spaces, generated by nothing more than your own drive and some deep…. resonant…. breath. And when, after this ritual of movement is enacted over and over again, a habit like a rabbit hopping through fields of vulnerability to find food without first becoming it, we celebrate. We come together and we celebrate our craft with a race. A festival. 7. Then we play. I think the planet is asking us to play. Humans need innocent play. When we run, when we practice this shared age-old craft of romping around ribbons of rut and rock, dodging through forest, skipping over knuckled root and babbling stream, we are playing. We are dancing. So, I see trail races as a day of play: a wild jungle-gym of natural twists and turns. If we forget to remain playful, if we take ourselves too seriously and forget that playing is what may save us in the end, then we lose. 8. I don’t want to lose. 9. I don’t want to lose this planet, this home I wombed into, cried into, crawled into, waddled into, stumbled into, walked into, then, miraculously, ran into. 10. So, I propose that we must continue engaging in practices that get us closer to that burning core of the planet, and of ourselves. Trail running and racing might be one of the most effective ways to get more people immersed in the very environment that educates us, humbles us, speaks to us, and sustains us. 11. There is a movement happening in the running world right now, and that movement is pointing towards dirt. 12. This is a good thing. 13. It’s true. Races use. Yes, things are used. People drive to races. Hotels rented, big dinners prepared. Runners use gels and paper cups. 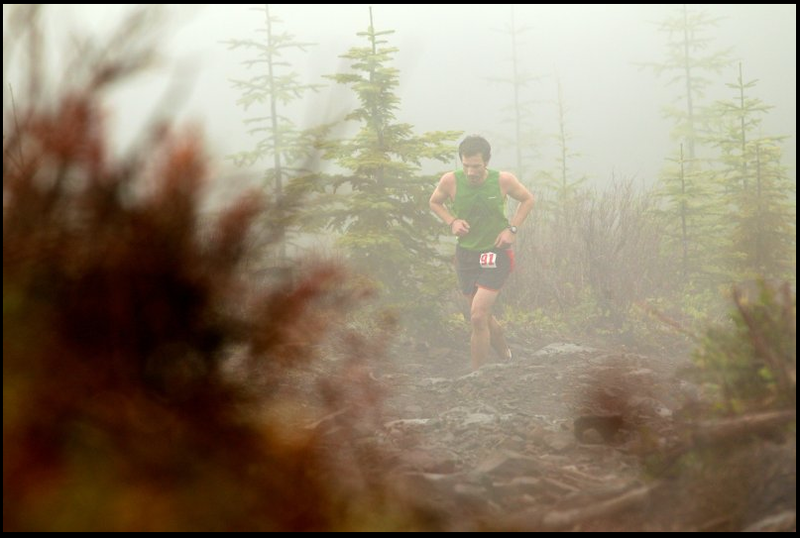 The trail race takes a tremendous amount of energy to conduct. It takes people often traveling far to get to the race and great logistical fortitude to secure a safe, legal, challenging course. This happens; it’s part of the process. I think that we can improve on all of these things, and we should. Cupless races, for example? Yes. Yes. Yes. 14. As we contract closer to the flickering urban fire ring of commerce and commodity, we are also adhering to a steadily increasing diet of cyber-sustenance that demands our attention, leaving us so often bleary-eyed, isolated, and distracted. So, this is all the more reason to defy the squares and boxes we are putting ourselves into…and race. And relate. Relate to our community, both human and non-human, a planet in jeopardy but a wild, wonderful, abundant place in which we belong. 15. Trail races doing harm to the environment? Only if you define harm as nature-based celebrations of ritual performed by strong communities of individuals seeking playful practices of simple movement that deepen our participation with natural spaces. This entry was posted in Exploration by Nicholas Triolo. Bookmark the permalink. Terrific blog Nick…..in total agreement that foot travel is as natural as our heartbeats. Our transgressions of race day procedures, can be mitigated by consciousness awareness, such as yours….mighy proud! Love you Pop. Thanks for being there through em all. Yo dude, I don’t really have anything illuminating to add, but just wanted to say I appreciate your voice and the fact that you put this kind of content out there. The community needs more of it. The Frog and I need to rally up north one of these days. Dr. Bow, you’re pure gold, man. Thanks for the shout! Be good. Nick, I know it when I see it, even though I am far from attaining it: your spirit and your expressions of it have grown by leaps and bounds in the last few years and are approaching sublime. You are inspiring, dear friend! Emily Dickinson wrote this about you: “The soul should always stand ajar, ready to welcome the ecstatic experience.” The key word there is ‘always.’ I am repeatedly inspired by your constant (and keen) awareness. And you as well. What an honor to receive such kind words from a man I look up to so much. Big love, Brian. A playful yet eloquent description of that very special thing that binds all of us in the human powered adventure sports. Thanks for writing. Thanks brother for the thought. Your support is huge. Go big.